Daniela Baker is a social media advocate at CreditDonkey where she helps entrepreneurs find small business credit cards. She grew up in Europe where public transportation plays a huge role in everybody's life. Public transit "consumers" like Daniela are finding their voice and publishing it on the web for all to read. With that newfound confidence, they are discussing political issues, gaining support for changes to be made when it comes to public funding and increased public transit choices. With more and more people on the road and gas prices on the rise, Americans are looking for a better alternative to commuting by car. Unfortunately, many transit systems can be hard for the newbie to decipher, or fall short in offering what citizens are after. Even more unfortunate, many people are unaware of the options their towns offer when it comes to transportation. When consumers aren’t finding what they’re looking for when it comes to public transportation, they are turning to social media to help garner the influence they need to get the services they’re after. This has left many professionals scratching their heads, uncertain how social media can influence a public service. Here are some answers as to why consumers are turning to social media when it comes to public transportation, as well as how consumers and cities are driving the social media efforts. A poll released in March 2010 by Smart Growth America and Transportation for America found that Americans are craving more transportation options. The poll indicated that Americans would be open to doubling the amount of funding that is currently being funneled toward public transportation. The poll found that Americans are frustrated with the transportation options that are currently available. In fact, 73 percent of respondents stated they have no options other than driving as much as they currently do. In the study, only 1 in 5 of those polled took public transportation during the previous month (this included walking) but indicated they would like to use it more; about 47 percent indicated public transportation is not an option in their area and 35 percent said the timing of routes did not work with their schedule. These survey results were not only for metro areas but applied to suburban and rural areas as well, with respondents stating that rural areas would also benefit from increased transportation systems. In fact, 79 percent stated that in rural areas the U.S. would benefit from expansion and improvements made to both bus and rail systems. Eighty-two percent of suburbanites shared the same sentiment. In the past, when a consumer was looking for information, they would go to the local library to research an issue or visit town hall for information on public services. If they were unhappy about the services provided or felt that there was a need that was being missed, they would meet with their elected official. Nowadays, citizens are going straight to the Internet to get answers and try to make change. With social media like blogs, Twitter and Facebook, and websites created by the common consumer, people are making real connections with people who they have never met in person. Nielsen Research wanted to see just how large of an influence social media has on today’s consumers. This question was answered with a study they conducted in 2007. When asked what sources they trust, chat/discussion comments and blogs ranked two and three on the list, just behind other consumers. Other choices included brand websites, TV/magazines, radio, sponsorships, search ads and banner ads. Tech savvy individuals have started to take action by creating social media outlets that help fellow commuters find the information they need to make public transportation options work with their commute. PBS.org has profiled one such effort – IAmCaltrain.com, which is utilizing web technology to make regional commuter train schedules easier to decipher. The site allows commuters to type in their starting and ending destinations and it maps the closest train stations and shows when trains are scheduled to arrive. As websites like IAmCaltrain.com and commuter-driven blogs continue to be created, they are encouraging others in their area to embrace the transportation systems that are available to them as well as voice their opinions about what could be improved. Cities across America have started to embrace social media to help encourage their citizens to take advantage of the public transportations that are available to them. June 16 was the 6th Annual Dump the Pump Day, sponsored by the American Public Transportation Association (APTA). APTA partnered with cities across the U.S. to encourage citizens to park their cars and utilizing public transportation for the day. As reported by StatePress.com, the City of Tempe was one of the public organizations that participated in APTA’s annual event. City employees turned to a method they knew would be effective to get the words out to Arizonians—they went to Twitter and Facebook to encourage residents to choose public transit, showing the cost savings available through using alternative modes of transportation (gas prices in the Phoenix area have been hovering between $3.50 and $4.00 per gallon since 2008). Outside of government, citizens and the private sector are asserting greater control over transit information. Google Transit is now the go-to source for routes and schedules over much of the world, and many transit agencies are increasingly deferring to Google rather than maintaining their own expensive systems. More importantly, Google’s standard public data formats let anyone access route, schedule, and even real-time location data. As a result, entrepreneurs have developed countless web and phone applications to present and customize transit data, so that customers can increasingly choose the style and emphasis that they want in their own information. Down at the grass roots, activists are even drawing new styles of map for their transit systems, promoting these through social media, and getting their transit agency’s attention as a result. Most leading transit agencies now have Facebook and Twitter accounts, and some put significant effort into both listening and communicating via these tools. The trick, of course, is not just to listen for suggestions and opinions, but also to notice how the whole communication task is evolving as new tools are invented and new ways of using them arise. The hardest challenge for transit professoinals is simply to be open to innovation arising from the social media sphere. Sometimes, online innovators will do something better, and more cheaply, than a transit agency can do it. As that happens, the transit agency's interest may lie in encouraging public innovation, not trying to control or limit it. I’m not really sure the action is about social media at all. Google Transit, like Google Maps before it, was a revolution in how its set of data was presented. Various local services have refined this by adding local search tools and filling in services Google doesn’t cover. None of these tools are inherently social — they present the flat facts about how to get places using transit. That’s why Google is the big player, not Facebook or Twitter. You can imagine the insanity of a social transportation site — “8 of your friends Like(tm) the #44, from Ballard to U District”… But you’re trying to get to Columbia City! Social media has helped with promotion of some of the tools, especially the local ones… but probably more blogs than dedicated social sites. Blogs about transit are quite public, commenters are semi-anonymous, and followed by people on the basis of their interests, not relationships. Blogs about ideas existed long before social media hype, and are useful and interesting to people like me that don’t really care about most social media. 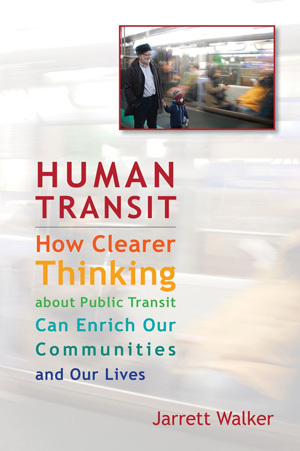 So, I guess the takeaway for transit agencies is that they can make big improvements just by providing (or helping someone else provide) clear, correct, and timely sources of information. Before transit agencies try to reap the gains of the social web they’ll have to get on the boat of the information web, which for various reasons they haven’t yet mastered. Various local services have refined this by adding local search tools and filling in services Google doesn’t cover. None of these tools are inherently social — they present the flat facts about how to get places using transit.